7 Things To Do When It Is 17 Below And 7 Inches Of Snow Cover Your Studio! As at write this it is my Dark Sky app tells me it feels like zero degrees outside. It’s going to be 17 below a little after midnight. That is cold. And it’s going to get colder. 50 below next week. The Blast Factory is a two part studio. The best part of the The Blast Factory is outdoors. That is where all the good stuff happens. Fire. Smoke. Explosions. Art. See as much as I would like to blow things up in the house, Renee does not think it a good idea. So here are 7 things I do when it is 17 below zero and 7 inches of snow cover my studio. Fire up the Not-A-Flamethrower. It’s fun. It’s warm. Did I say it’s warm. Count fuses. I have hundreds in a big pile. it’s boring work. I need more inventory. I need to figure out which ones are out of stock. I think this is advanced thinking. It’s hard to think when it is so cold. My VP of Sales, Mike, told me to go to the Tyme machine and get some cash. Tyme machines are gone now. But, who knew in the old days you could go back in time to get cash. I’ll tell Renee, “Hi honey, I’m going to the Tyme machine. Be back in a while.” Why cash? Cash buys a beer at Waypoint. Explode some snow. Gunpowder. Snow. Explosion. Fun right? 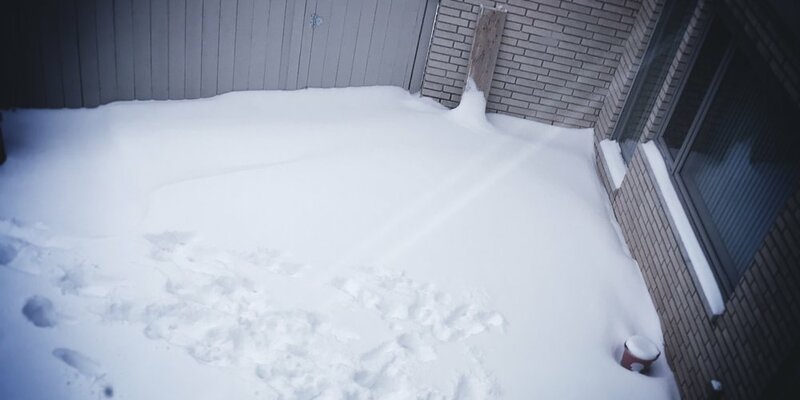 Plus there is not as much to shovel later. And bonus! I can rotate my gunpowder. Keep it fresh. That must be important, it says it on the box. Take some snow photos. Why? I think I need to keep a record of this! Just like last year. And the year before. And the year before. Show Renee the weather report on my Dark Sky app. She really loves it when I show it to her every few minutes. Like 35 times a day. That is why she loves me. I’m prepared. I am driving her crazy. Take some furniture outside and set it in the snow. Bring a boom box and a lamp. Hang out for bit. Ryan and Justin at Driftless Provisions taught me how to do this. It looks fun. The cold could kill me. Did I say It looks fun? If you have more ideas for me, please pass them along, I’ll be checking my Dark Sky app.